Italian novelist Alberto Moravia once wrote, “Friendships are not chosen by chance, but according to the passions that dominate us.” That was true even some 2,000 years ago when Xi’an, capital of the Western Han Dynasty (206 B.C.-A.D. 25) in China, and Rome were linked up by the ancient Silk Road driven by the passion for connectivity and growth. Today, once again propelled by strong growth incentives, modern China and Italy have joined forces to revive the historical trade route. On March 23, during Chinese President Xi Jinping’s state visit, Italy signed a memorandum of understanding to join the Belt and Road Initiative. Italy was the first leg of Xi’s three-nation Europe visit from March 21 to 26, Monaco and France being the other two. The careful selection of the three European nations for Xi’s first foreign visit in 2019 illustrates the great importance China attaches to China-EU relations, Cui Hongjian, a senior researcher on EU studies with the China Institute of International Studies (CIIS), said. 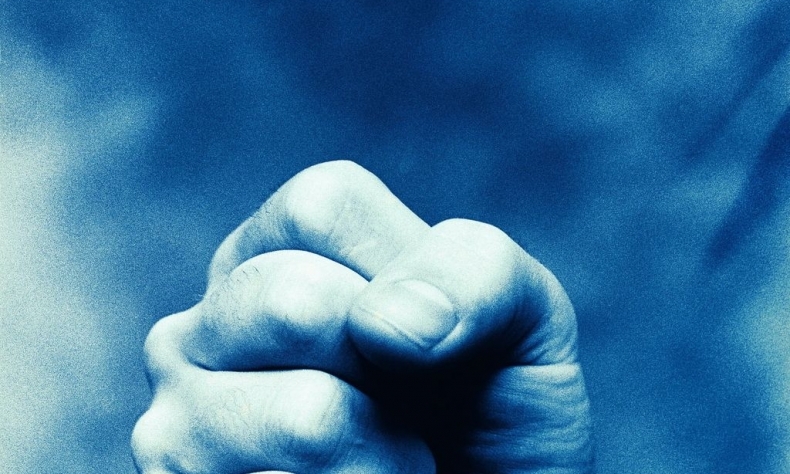 The world today is undergoing unprecedented changes and Europe faces both internal problems and external pressures. China and Europe, as two major forces, should contribute to sustainable global economic growth and world peace and development, Cui added. Also, China’s Two Sessions, the annual meetings of the national legislature and the top political advisory body held in March, sent out a clear signal that China would expand its opening up for win-win results to be shared with the rest of the world. Against this backdrop, Xi’s Europe visit is not only a critical step in enhancing major-country diplomacy, but also gives positive information to the world at large and creates a favorable external environment for China’s economic and social development, he said. Xi’s overture was greeted with positive response from European leaders, who stressed the importance of consolidating China-Europe ties to safeguard multilateralism and their willingness to do so. The bilateral cooperation with Italy alone is anticipated to give fresh impetus to the China-Europe comprehensive strategic partnership and add some stability in a world descending into chaos. Xi’s visit brought greater recognition for the Belt and Road Initiative. Italy signed a memorandum of understanding with China on jointly advancing the initiative, while France signed agreements for demonstration projects in third-party markets and kicked off a third-party market fund. Experts say Italy’s joining the initiative will stimulate its flailing economy. Many European economies, including Italy, have still not succeeded in casting off the shadow of the 2008 financial crisis and lack the driving force for economic growth, Zheng Yongnian, a professor with the University of Singapore, told China News Service. Zheng claimed that participating in the Belt and Road and jointly developing third-party international markets with China can bring tremendous opportunities for Italy’s economic recovery. Moreover, according to Zheng, Italy is desperate to upgrade its crumbling infrastructure. The Belt and Road Initiative offers a remedy as it focuses on connectivity and infrastructure building. While decaying infrastructure has long troubled the Italian Government, its tight budget has limited its ability to address the deficiency. The Port of Trieste is an example of infrastructural decay. Once a shining pearl in northeast Italy enjoying strategic importance, it lost its luster in recent decades. Meanwhile, the various infrastructure projects built and operated under the Belt and Road framework such as the Port of Piraeus in Greece have had a positive demonstrational effect on Italy. On March 23, the Port of Trieste authorities and the China Communications Construction Co. (CCCC) signed a cooperation agreement in the presence of Xi and Italian Prime Minister Giuseppe Conte. The CCCC will invest over $1 billion to upgrade the port’s handling capacity and transport efficiency as well as facilitate infrastructure development such as railways to connect it to central Europe. According to Zhang Yuyan, a professor with the Chinese Academy of Social Sciences, as the first Group of Seven member country to sign a Belt and Road memorandum with China, Italy will serve as a model to attract more EU members and create more economic benefits. “At present, most countries participating in the initiative are developing ones. Italy is a developed country and an important country in Europe. Its cooperation with China under the Belt and Road framework will create a demonstration and radiation effect,” Zhang said. Major members of the EU, including Germany and France, have recognized the economic potential of the initiative. Although France has not officially joined the Belt and Road Initiative, French President Emmanuel Macron has expressed willingness to carry out practical cooperation with China on many occasions under the framework. In fact, France and China signed an agreement to jointly explore a third-party market in 2015, the first time China signed such a pact with other countries and an important model of cooperation under the Belt and Road Initiative. Macron responded by saying that France will cooperate on a number of investment projects in some of the countries involved in the initiative. The EU’s connectivity strategy and the Belt and Road should be docked, he said. 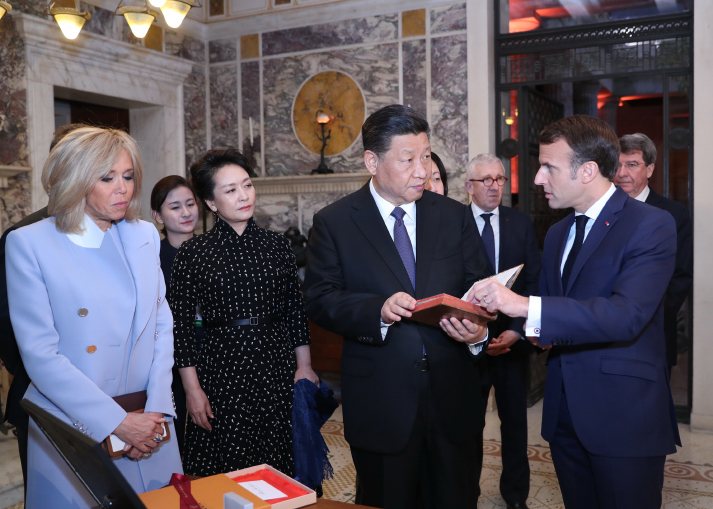 Macron also confirmed France’s participation in the second Belt and Road Forum for International Cooperation to be held in Beijing later in April and the second China International Import Expo in Shanghai. Jean-Maurice Ripert, French Ambassador to China, told the media earlier this year that the two countries have identified six to eight programs to be implemented in third-party markets, including French-speaking African countries. Besides Italy and France, China has fruitful cooperation with other European countries under the Belt and Road Initiative. For example, the 16+1 mechanism jointly launched by China and 16 Central and Eastern European countries has produced substantial results. Malta, Greece and Portugal have also signed memorandums for more cooperation with China under the initiative. 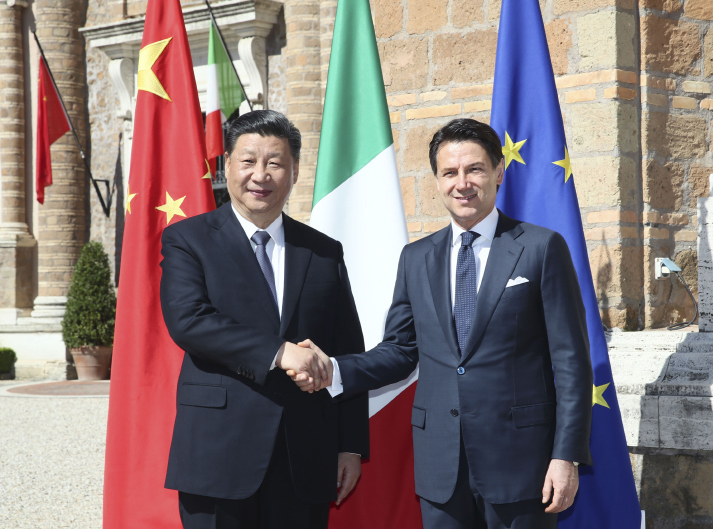 This year marks the 15th anniversary of the China-Italy comprehensive strategic partnership, and next year will be the 50th anniversary of their diplomatic relations. However, compared with other leading EU members, the huge cooperation potential between China and Italy remains untapped. In 2018, their bilateral trade totaled $54.23 billion, lagging far behind the $183.9-billion China- Germany trade. Italian exports to China last year totaled $21 billion, a meager sum compared to Germany’s $106 billion. While Italy sends 6.5 percent of its exports to China, for Germany the figure is 17 percent. Italy wants to enhance its “Made in Italy” brand through increasing exports to China. The Belt and Road Initiative is seen as a vehicle to achieve this. Italian goods, especially luxury goods and agricultural products such as wine and cheese, are increasingly attractive to China’s growing middle class and rising affluent population. “Made in Italy is a guarantee of quality, Italian fashion and furniture are immensely popular with Chinese consumers, and pizza and tiramisu are the love of many young Chinese,” Xi said in a signed article in Italian newspaper Corriere della Sera. He told Italian officials during the visit that China is willing to import more high-quality products from Italy and encourage more capable Chinese enterprises to invest and start business in Italy. This year also marks the 55th anniversary of China-France diplomatic ties. Fifty-five years ago, the two nations took the lead in breaking Cold War barriers and reached out to each other. During Xi’s France visit, the two leaders reaffirmed the commitment to forge a more solid, stable and vibrant China-France comprehensive strategic partnership and continue to explore the way for major countries to get along with each other based on independence, mutual understanding, foresight, mutual benefit and win-win outcomes. 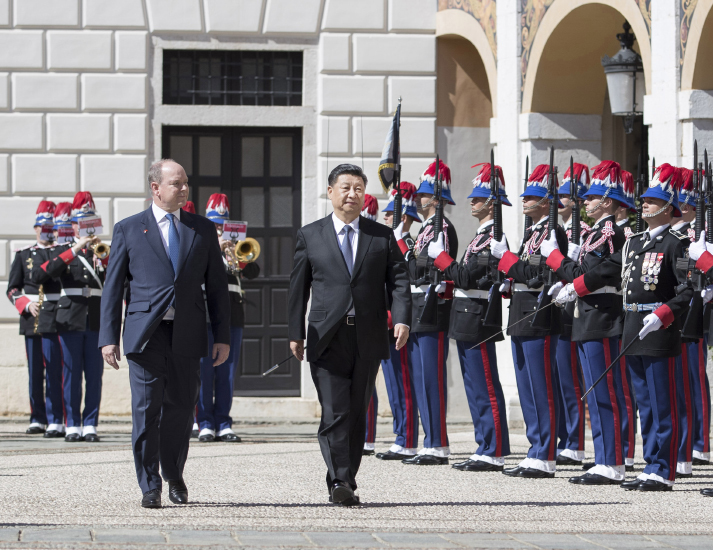 Xi also visited Monaco, the first visit to the European country by a Chinese president. Monaco has taken the lead in China-Europe cooperation in environmental protection, telecommunications and mobile payment. Last September, Monaco Telecom, the main telecom service provider in the country, clinched a deal with Chinese company Huawei to develop its 5G network. Monaco is expected to be the first country in the world to be fully covered by 5G mobile networks. China and Monaco, the second smallest country in the world, have set a fine example of friendly exchanges between countries that are different in size and have different historical and cultural backgrounds and social systems, Xi said. “Xi’s visit to Monaco shows how China treats all international members equally, no matter whether they are big or small,” Ruan Zongze, a researcher with the CIIS, said. Ruan said there are concerns that as China becomes stronger, it will grow more aggressive. However, the reality is different. China has always sought friendly, cooperative and mutually beneficial relations with other countries. Xi stressed China’s willingness to strengthen Sino-EU relations and global governance cooperation at a global governance forum co-hosted by China and France in Paris on March 26, which was also attended by Macron, German Chancellor Angela Merkel and European Commission President Jean-Claude Juncker. In his keynote speech at the forum, Xi raised “four deficits” in global affairs: governance, trust, peace and development deficit. To address these deficits, he proposed a four-pronged approach of fairness and reasonableness, consultation and understanding, joint efforts and mutual assistance, and mutual benefit and win-win results. The European leaders agreed with him. Macron said communication and coordination between the EU and China play an indispensable role in safeguarding multilateralism. Merkel said the EU and China should cooperate to safeguard multilateralism and compare notes on reforming the World Trade Organization and other multilateral institutions. Juncker said the EU and China are important strategic cooperative partners and it is important that they maintain dialogue on an equal footing.